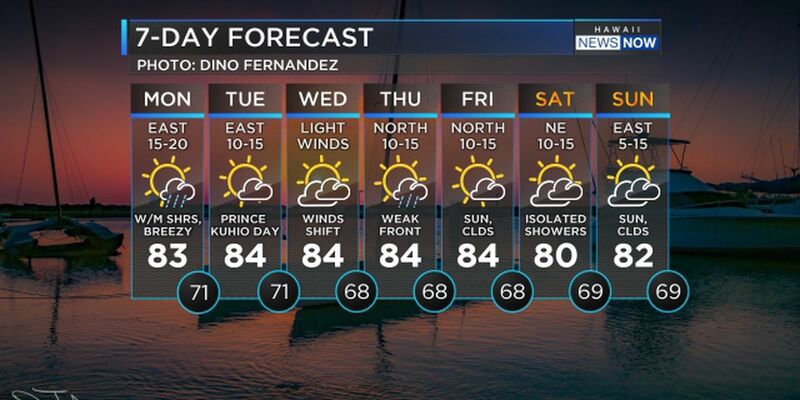 HONOLULU (HawaiiNewsNow) - Moderate to breezy trade winds will hold through Monday. Windward and mountain showers will continue with increasing trends for these areas on Monday. The high pressure fan north of the islands begins to weaken on Tuesday with trade winds decreasing in strength becoming light and variable on Wednesday ahead of an approaching cold front. Clouds and showers along the frontal band will reach the northwestern islands from late Wednesday night into Thursday. Cool northerly winds will develop after frontal passage. The current north-northwest swell will gradually decline late tonight through Monday night. A small reinforcement out of the north is expected Monday night through Wednesday, followed by a small northwest swell Tuesday night and Wednesday. Surf will remain below advisory levels during this period. A new moderate sized northwest swell will build Wednesday and Wednesday night, and could approach low end advisory levels Thursday through Friday. Surf will remain along north and west facing shores Friday night through the weekend as new overlapping moderate sized north-northwest and northwest swells move through the island chain.